California Design and Build LLC (CDB) is offering to direct the development of this property on behalf of the owners or for a third party. The following is a development concept by CDB for consideration. It is the opinion of CDB that the purpose of the development should be to create a ‘multi-use’ artists’ live-work community, in order to obtain the maximum return on investment for the longest period of time. The purchase price is the lowest in the area for its kind. CDB believes the property is potentially worth the asking price of $6,150,000 ($75.47 per sq ft). The same sized property on Seaton St which was on the market for the same price sold recently for $5,150,000. The property is the lowest cost in the local area. There are two similar undeveloped buildings nearby that are on the market at a higher value, but not as in good a condition. The Capitol Garment Building, 217 E 8th Street is located in the Los Angles Fashion District, half a mile from the skyscrapers of downtown. The skyscrapers are clearly visible from inside the building, on the roof, a panoramic view of all Los Angeles. This 85,000 sq ft skyscraper-of-its-day was built as a in 1926 using steel and concrete. It has usable concrete flooring throughout, a functioning freight elevator, and a spectacular view of the downtown skyline. The building was originally built to serve the garment manufacturing industry, which it continues to do today, albeit at 56% occupancy. On either side are two recently developed buildings which have been converted into condominiums which are almost fully occupied. The area now has scores of new restaurants and vendors which serve the recent influx of residents into the local area. CDB proposes redeveloping while structurally changing nothing to the building. This building is historically significant, as well as structurally sound; any course of action other than restoration and preservation would be an unneccesary cost both financially and environmentally. Adaptive reuse of the existing structure as it stands is faster, more efficient, and will provide a higher return on investment with less time, energy and money. The most beautiful product on the market will always have a customer and there’s no reason why this project cannot be at least as desirable as any of its competitiors. 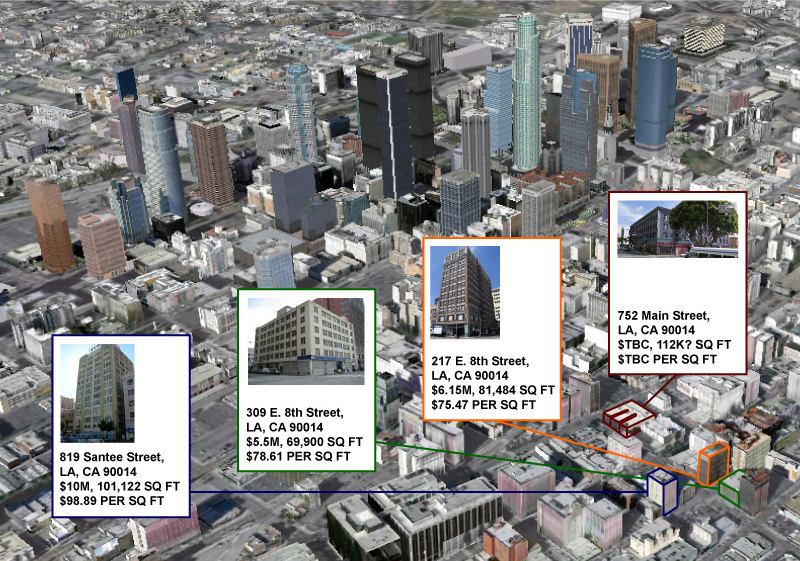 At the same time, CDB proposes that a target price for leasing should be the lowest available locally (lowest average price per sq ft across the building for residential properties in this area of downtown Los Angeles). In short, we should endeavour to create the most desirable product within the market for which there is demand, for the lowest cost available. Energy use for buildings is the number one talking point in the construction industry today, and for good reason. In America, 40% of all energy consumed is by residental and commercial buildings. The target of energy efficient construction is the zero energy building (ZEB). A ZEB consumes no energy and in some cases produces energy which can be supplied back to the grid and sold to the power companies. These technologies are current and available, and do not cost any more than traditional gas or electric systems. These heating, cooling and hot water systems consume only energy obtained locally, from the sun, using solar panels, or from ambient heat using air based heat pumps or both. CDB has utilized ground pump water heating systems powered by solar panels. Half the task for a zero energy building is to not lose the energy that it has generated or conserved. When it’s cold, heat loss needs to be prevented. When it’s hot, solar gain needs to be avoided. LED lighting consumes 10x less energy than a system which uses regular bulbs. Even the heat generated from different areas of the house like the kitchen and bathroom can be tuned into energy using heat exchanging ventilation. A lot can be achieved with very little effort. Good design comes from the use of elements that increase beauty and functionality and removing elements that do not. What doesn’t add, detracts. Making a beautiful environment does not require the most expensive decorations. It requires careful consideration of all the elements including content, colors, tones, composition and light, just like the painting of a picture or the taking of a photograph. A community of artists should have a permanent gallery. Although art will inevitably be scattered throughout the building there should be an offical area with art for sale. Art needs to be refreshed periodically. Galleries are businesses like any other, even though they are little more than four walls upon which to hang pieces of art. Shows and events are a significant source of income for galleries and artists. They are the traditional method of networking and offer the opportunity for artists to platform their work. Professionals can meet new clients and entertain existing ones. For visitors it is an opportunity to enjoy an art show and have some fun. CDB selected five local buildings suitable for redevelopment and CDB’s construction director has made first stage cost-estimates for each of them. 217 E. 8th St is in the best condition and requires the least amount of work. The estimate for the redevelopment of this site is $14M, and has been confirmed by acquiring the itemized list of costs of the Union Lofts, a completed redevelopment nearby, with almost identical specifications. For residential lofts in the immediate area, the average sale price per square foot locally is approximately $330 per sq ft (based on a CDB survey of local properties SOLD in the last year). The official average sale price per sq ft for the 90014 zip code is $347. If the saleable area was 80% of the 81,484 sq ft of the building, then separately, the 65,187 of units would sell for $21,511,710 at $330 per sq ft or $22,619,889 at per $347/sqft. For residential lofts in the immediate area, the lowest average (per building) lease price per square foot is $1.85 per sq ft, per month (based on a CDB survey of properties LEASED in the last year). This can be confirmed by averaging the lease prices of the Emil Brown development, just one block away. If the leaseable area was 80% of the 81,484 sq ft of the building then this would mean that separately the units would lease for a total of 65,187 x $1.85 = gross $120,596 per month or $1,447,151 annually. Building expenses are currently $277,077 annually (maintenance, utilities, permits, licenses and security). Property tax is currently $109,415 annually. If the building continued to incur the same expenses, it would net $1,060,659 annually or $88,388 per month. Traditionally contractors are trusted to be able to judge accurately exactly how much the enire job will cost. Depending on the contractor this may be acceptable. CDB recommends the use of a quantity surveyor, a role more common in the UK. Quantity surveyors are highly trained in giving both conceptual and actual cost estimates for construction jobs, counting and calculating every nut, bolt and 2"x4" in the project. The cost of restoring the building is pivotal to knowing whether the purchase cost is reasonable and indeed if the enitire project is a viable one. Knowing this information beforehand is worth the relatively insignificant cost of a survey at the beginning. CDB would like to represent as prinicpal/referrer to the buyers agent. 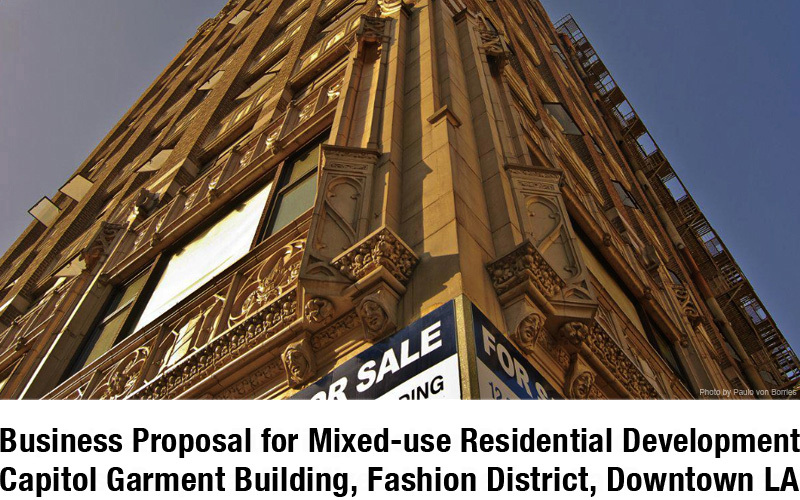 CDB is willing to direct entirely and/or consult or assist in the redevelopment of this property at every stage, from beginning to end; from the conceptual stage to the marketing and management of the building as a business. The buyers agent fee will be collected from the seller, at no cost to the buyer. Financial arrangements regarding redevelopment and construction can be quoted and negotiated as a package, or in parts as required, before or after the sale of the building. CDB has a track record for directing record breaking, successful and profitable projects since 2003. We would like for this project to be a continuation of that success, setting new standards and creating new records in quality, price and social responsibility for the redevelopment of historical buildings in Los Angeles.